Police identified one of the militants killed as Dawood, who was heading the ISJK, an affiliate of ISIS. Srinagar: Four militants, including the head of the Islamic State Jammu and Kashmir (ISJK), were killed during a gunfight with security forces in Jammu and Kashmir’s Anantnag district on Friday, police said. Police identified one of the militants killed as Dawood, who was heading the ISJK, an affiliate of ISIS, he said. Three civilians are reported to be critical. “Four militants have been killed in the encounter at Srigufwara and their bodies have been recovered,” Director General of Police (DGP) SP Vaid added. He said a policeman was also killed during the encounter, which was now over. Security forces launched a cordon and search operation in Khiram in Srigufwara area of the south Kashmir district on Friday morning after receiving specific intelligence inputs about the presence of militants in the area, a police official said. 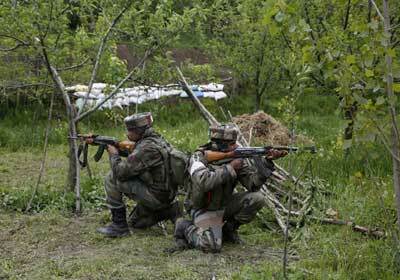 He said the search operation turned into a gunfight after the militants fired at the forces, who retaliated. Clashes broke out near the encounter site when a group of youth started pelting stones on the forces, a police official said. Security forces used force on the protestors and several civilians were injured, he added. Authorities have suspended mobile internet services in three districts – Srinagar, Anantnag and Pulwama – of the valley as a precautionary measure to maintain law and order.